Oh my! Wonder who’s upset him!! 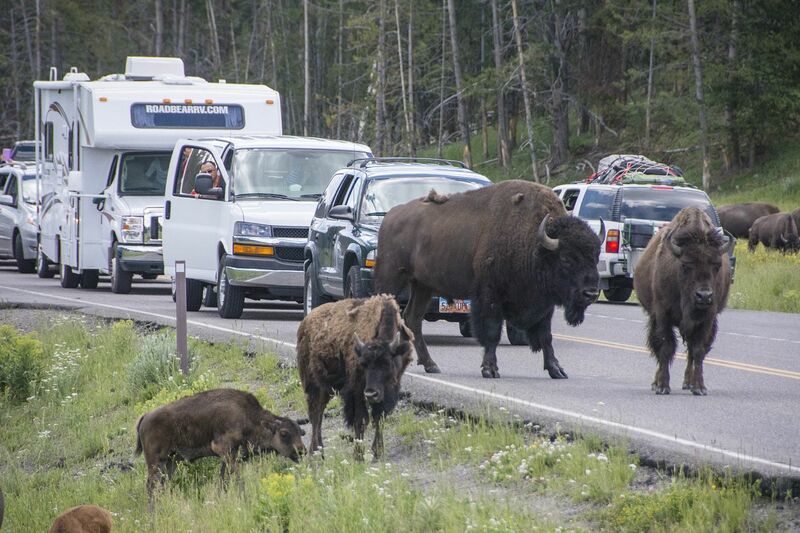 Buffalo Herd crossing the road and causing chaos! 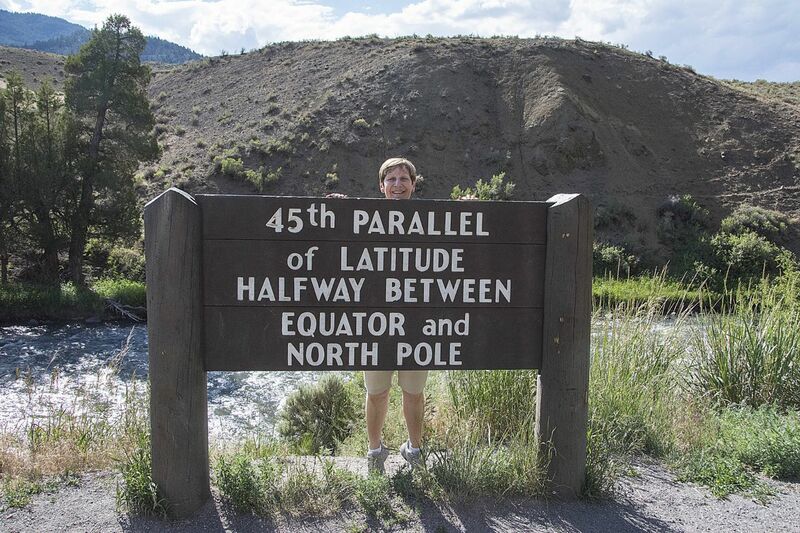 Me at the 45th Parallel stood on tiptoe! 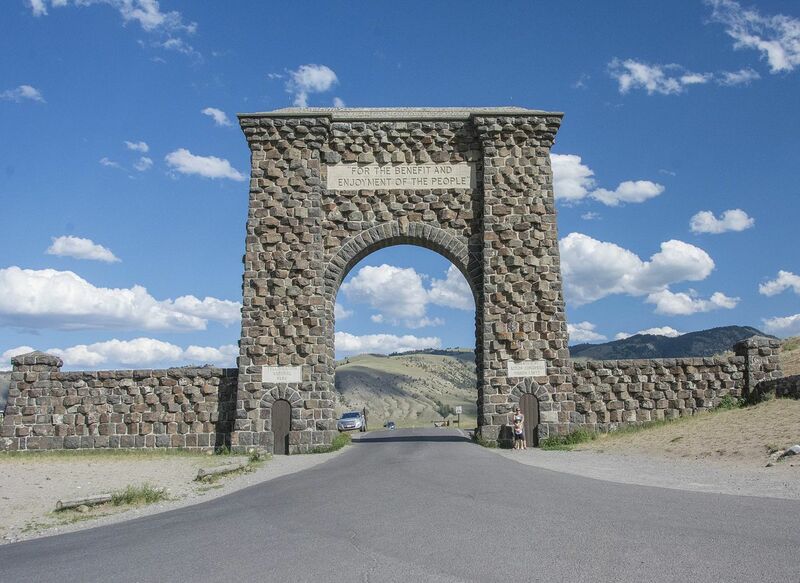 And last but not least for the second time this trip … the Roosevelt Arch! 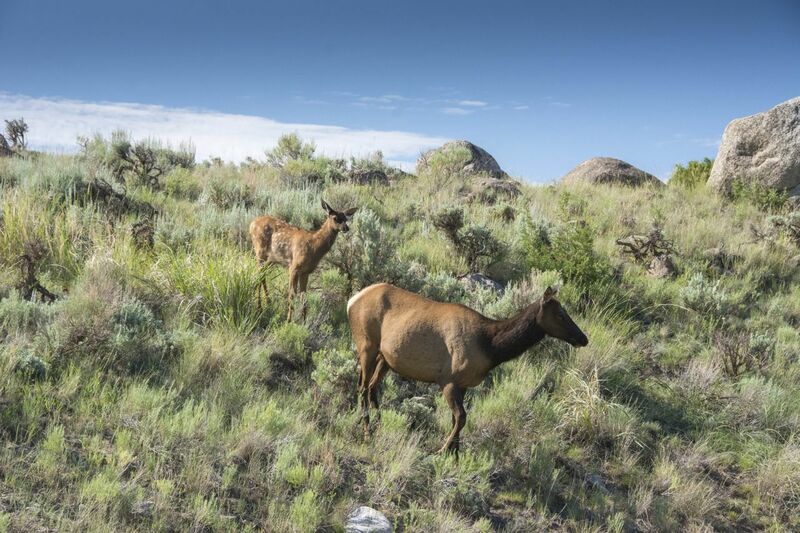 As we drove down from the mountain this morning we were treated to the sight of an elk and her fawn crossing the road right in front of us. What a lovely way to start the day! 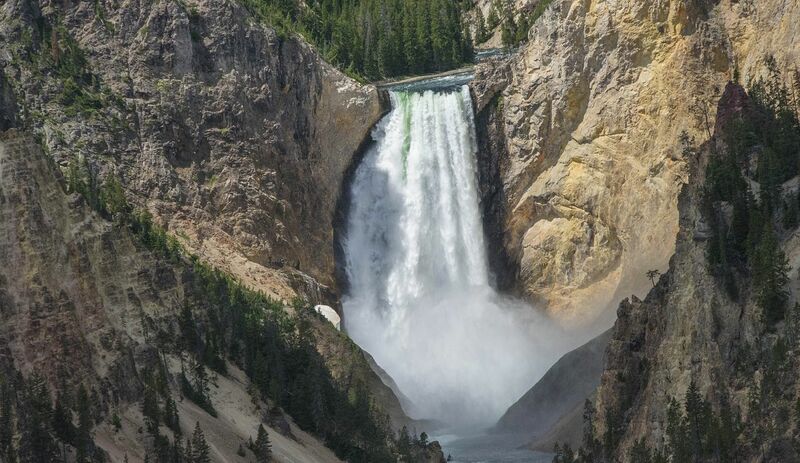 Today was our last trip to YNP and the weather has been slightly cooler which was a good thing because Simon did the Tom Thumb Trail (aka Uncle Tom’s Trail) which consists of a zig-zag path leading down to 328 metal steps to an overlook of Lower Falls. It’s said that there are 2,000 steps back up but in reality there’s only 328 plus a lack of oxygen and because of the altitude makes it feel like 2000. 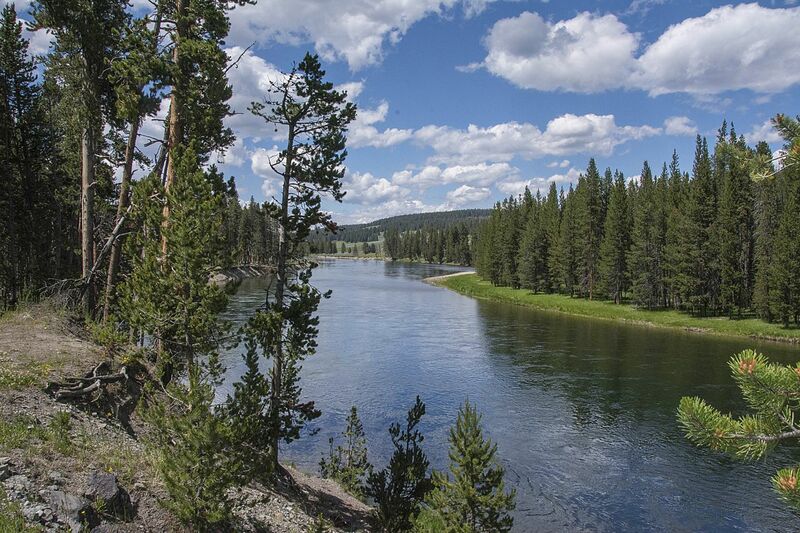 The trail was originally constructed in 1898 by park concessionaire, “Uncle Tom” H. F. Henderson when he was granted a permit to operate a ferry across the Yellowstone River. Henderson ferried park visitors across the Yellowstone River then escorted them to the trail and they travelled down to the base of the Lower Falls via ladders and ropes (even ladies in their long dresses). 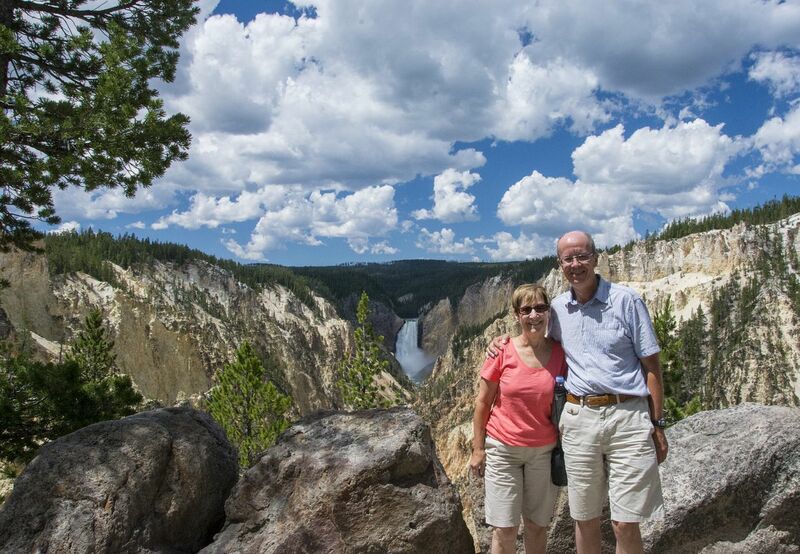 Upon their return, visitors were provided a picnic lunch on the south rim of the canyon before returning via the ferry. In 1903 when the original Chittenden Bridge was built, Henderson’s ferry business began to decline. In 1905, when the government built a wooden stairway, visitors were increasingly unwilling to pay Henderson the $1 fee for the tour to the base of the falls. 1906 was the last year he operated tours in the canyon. 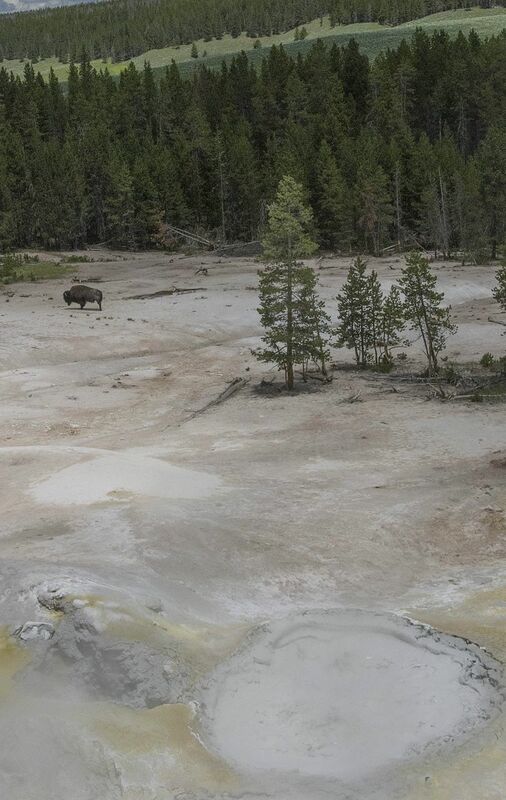 The trail has been maintained and improved by the National Park Service to this day. 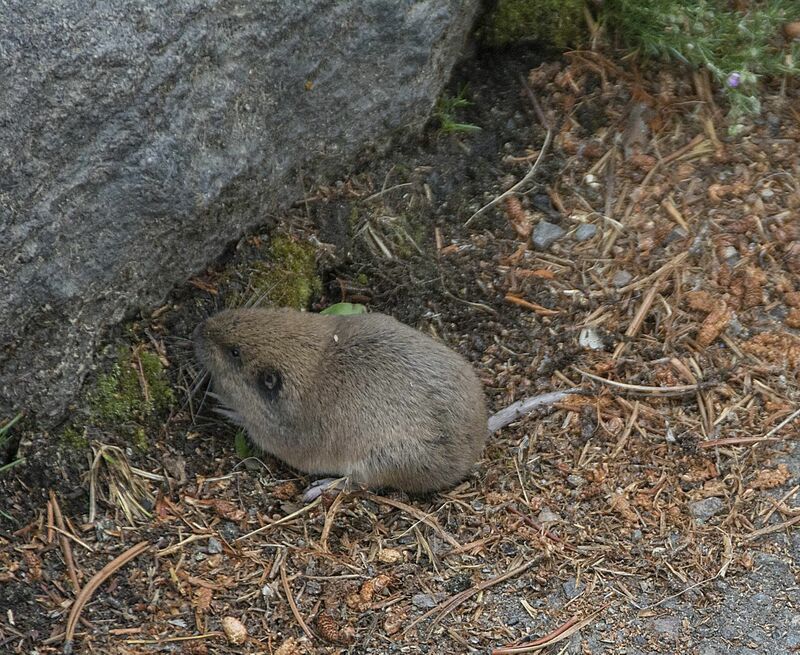 During a visit to one of the Visitor Centres today we saw this little mouse-like chap ….. anyone know what it is? 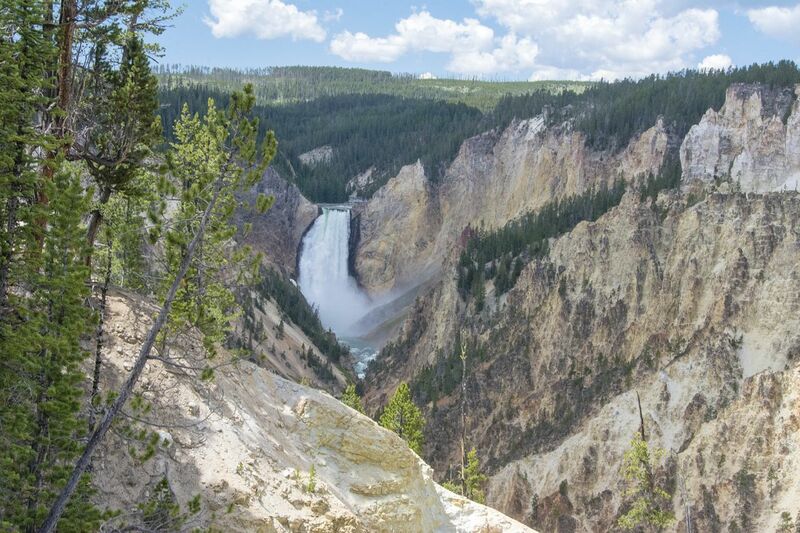 We visited Artists Point in Yellowstone’s Grand Canyon too and saw a man painting this view. 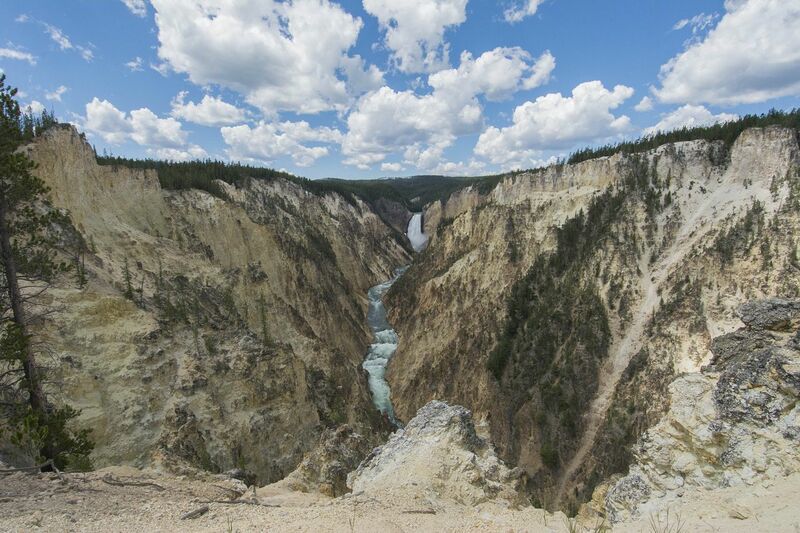 Although there are lots of places to view this part of Yellowstone, it is said that this point in the Canyon is the best for painters and photographers. 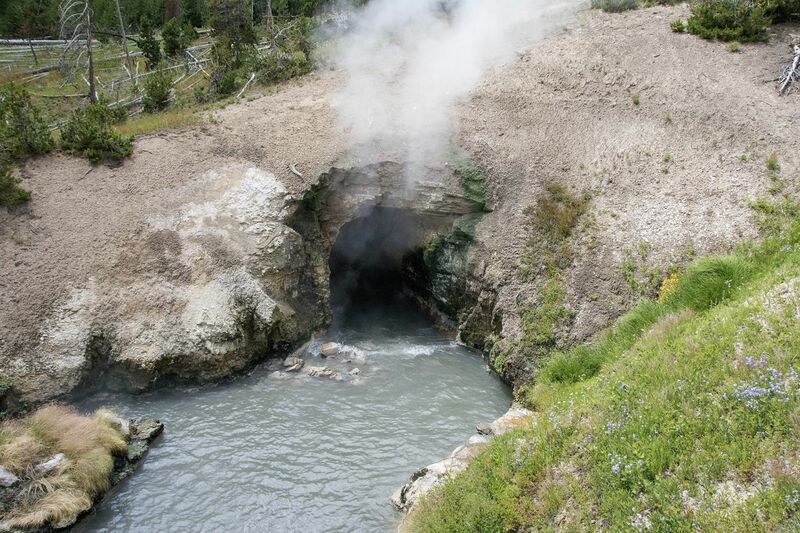 We visited the Sulphur Caldron and Mud Volcano and although they were not as colourful as the geysers and Prismatic Lake we’d seen before, they were still a wonderful sight to see and watching the mud bubble up and particularly the smell of rotten eggs was quite fascinating. It was also fascinating to see a buffalo wondering through the car park. Buffalo can outrun man so we were rather worried when it suddenly charged off and jumped over a fence. 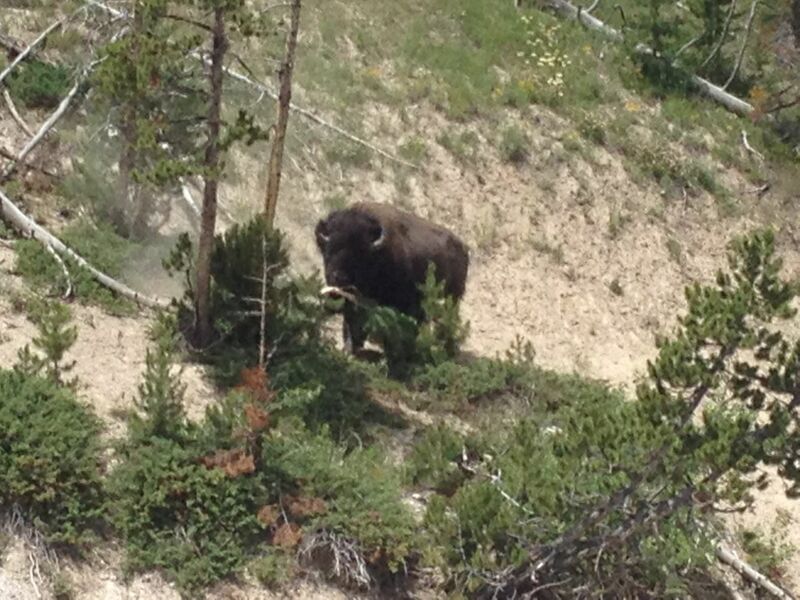 We saw it later ripping a branch off a tree. I think us humans had invaded his territory and he was rather cross! 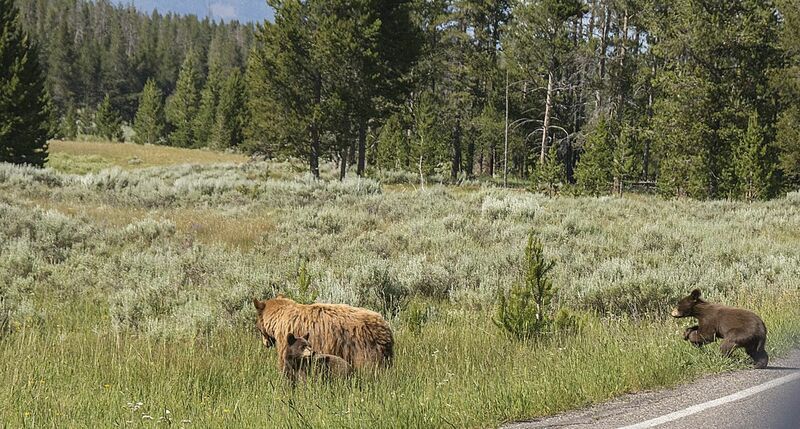 Today was also exciting for a couple of other reasons, firstly we saw a herd of buffalo crossing the main road, some with their calves and later saw a calf feeding from its mother and then to Si’s absolute delight we were treated to the sight of a mother bear with her two cubs, again crossing the main road. 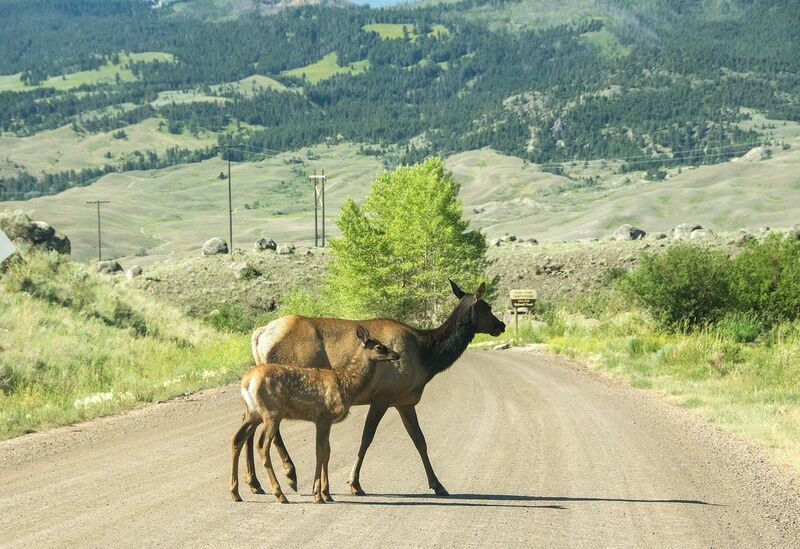 You can be driving along the roadway and suddenly encounter a huge traffic jam and that’s an indication that it’s either a buffalo, bear or elk jam meaning the animals are very close by and of course, everyone stops to take photos. Then, driving out of the Park we crossed the 45th Parallel which is called the halfway point between the Equator and the North Pole! 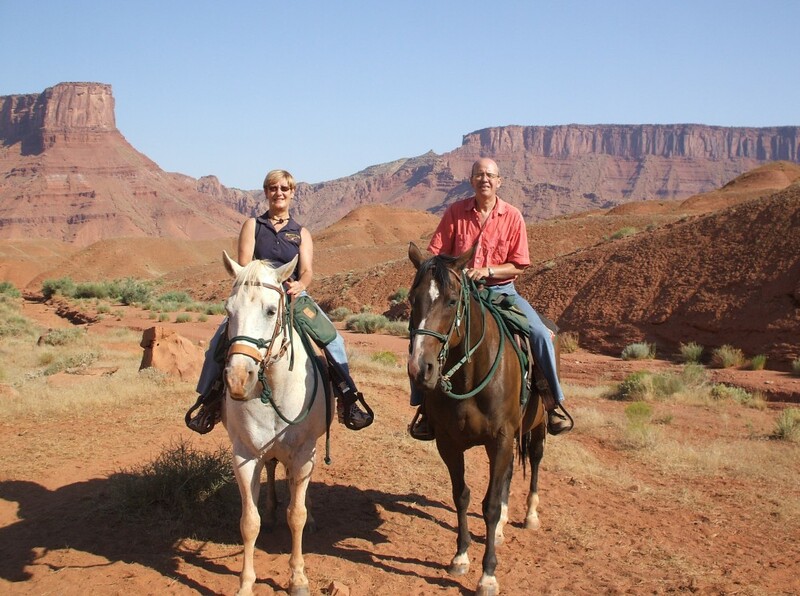 Tomorrow we leave our log cabin in the mountains for Cody, Wyoming and Buffalo Bill! 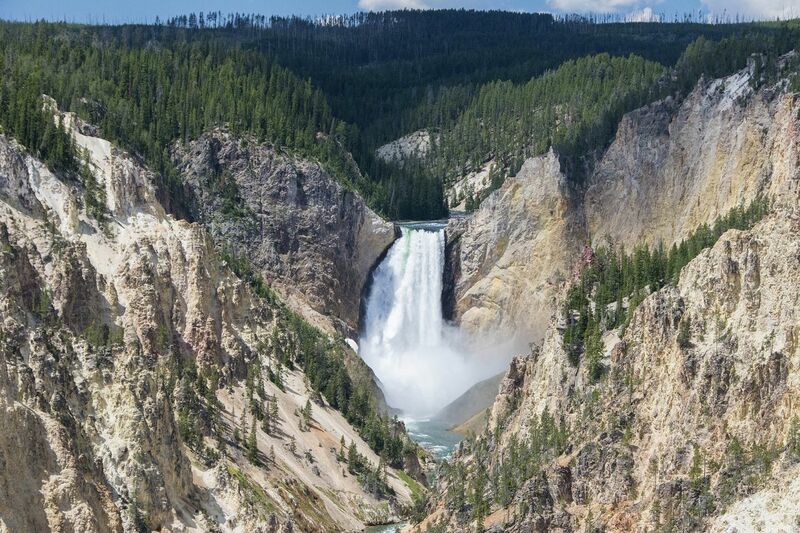 amazing photos of the Grand Canyon of Yellowstone, and i have to say i love the Dragon’s Mouth photo too. 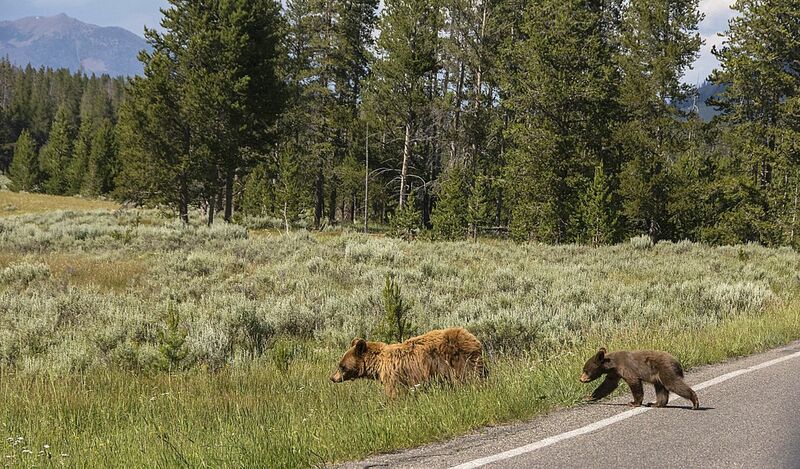 Those little bear cubs are great! I’m so happy you finally got to see lots of Bears, and Buffalo…not sure what type of animal that is, but i dont’ think it’s a mouse. Looks too big, but who knows!! Awww look at those babies. I would say Si has enough photos to keep him in first place for the rest of his life! 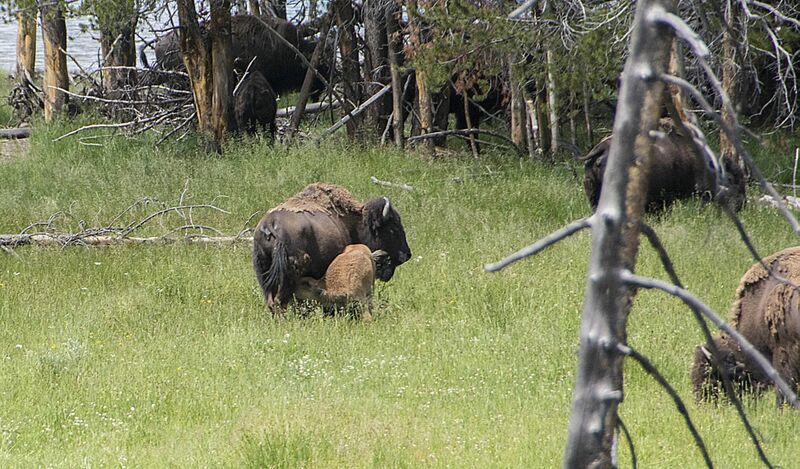 That’s very interesting about the buffalo ripping the branches off the tree. I wouldn’t have expected them to be able to do that! I sure hope so Dot. 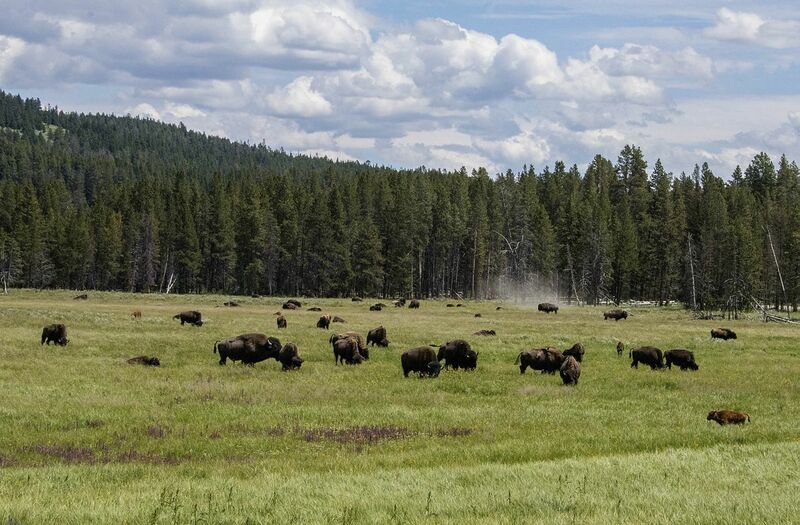 That buffalo was having a real ‘ripping’ time.